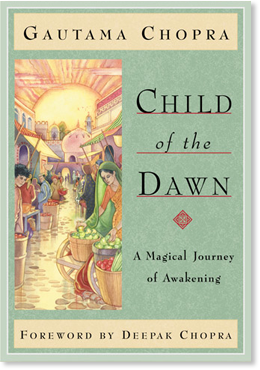 Based on The Seven Spiritual Laws of Success, Child of the Dawn tells a rich and colorful tale about an orphan boy, Hakim, who is lost, alone, and seeking his purpose in life. As Hakim becomes aware of himself and his lowly position in life, he dreams he is a king in a luxurious palace, surrounded by servants and adoring subjects. The stark contrast with his waking life inspires in him a desperate urge to make such a life his own. He embarks upon a quest for power and wealth, thinking this will bring him the happiness he seeks. It is a search for meaning, a quest for love, the justification of his entire existence. Searching for a mysterious “wise one,” Hakim encounters many colorful characters on his travels — helpful figures who impart timeless wisdom with wit and charm, shadowy eccentrics who tempt him with intriguing offers, and elusive guardian spirits who quietly appear to watch over him. Hakim’s journey takes him through inner and outer worlds as he struggles toward the dawn of understanding, and is led to an ultimate realization about the true meaning of power and freedom. As we follow Hakim’s search, we are led through the inner landscape of our own hearts into a deeper understanding of the spiritual laws that govern life and lead us to the fulfillment of our dreams. He was lost. Somehow during his young life, he had lost his way. Lost from where? Lost from what? Ah, well, you will see, we are not speaking of being lost in a labyrinth of streets in a twisted medieval city. His displacement, his disorientation, was of a more desperate and desolate nature, for he did not understand what he was lost from. The child was alone, truly alone, with no mother or father, no family, no home — nothing to call his own. Each day, as dawn woke the sleeping metropolis, he watched the world pass him by. There was little reason to persevere. He had no one to love, no one to laugh with, no one with whom to share his deepest secrets. There were no enchanted memories, nothing sacred at all to hold close to his heart. And then one day, inspired by his dreams of mirth and magic, he was drawn toward a search for power and lasting happiness. It was a search for meaning, a quest for love, the justification of his entire existence. And thus began his journey of awakening — a journey which led him from the realm of his dreams to a world of chaos, and back once more to a place where dreams really do come true. Hakim turned to the fisherman, looking at him closely for the first time. Despite his old age, the fisherman’s giggles and grins made him seem like a child. There was an irrefutable source of youth bubbling within him that permeated everything around him. Hakim felt this energy seep into him, filling his own awareness with bliss. There was something soothing in the old man’s voice, in this fisherman who didn’t catch fish and liked to tell stories. Hakim felt his own heart blossoming as he realized what it was. It was love. . . . The old man was quiet. He raised his head and faced the setting sun as if to feel the wisdom radiating from its light. He looked at the water as if to read an ancient script buried in the depths below its surface. He perked his ears as if to hear the whispers of the wind and the secrets it carried from faraway places. The old man is in love with life, Hakim thought as he looked out across the ocean, searching that elusive place where the sky embraces the sea. The water had turned a colorful hue of bright orange to match the setting sun.